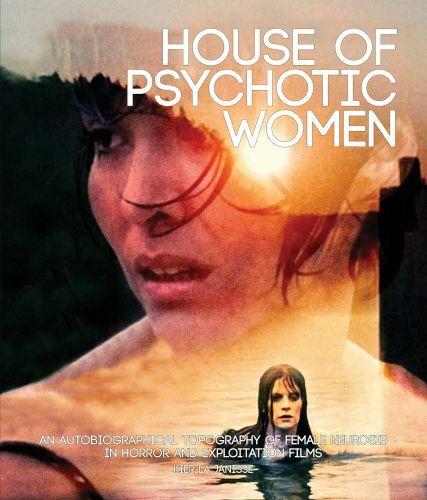 House of Psychotic Women is an autobiographical exploration of female neurosis in horror and exploitation films. Anecdotes and memories interweave with film history, criticism, trivia and confrontational imagery to create a reflective personal history and examination of female madness, both onscreen and off. God, this woman can write, with a voice and intellect that's so new. The truth in the most deadly unique way I've ever read. - Ralph Bakshi, director of Fritz the Cat, Heavy Traffic, Fire and Ice, etc. Fascinating, engaging and lucidly written: an extraordinary blend of deeply researched academic analysis and revealing memoir. Cinema is full of neurotic personalities, but few things are more transfixing than a woman losing her mind onscreen. Horror as a genre provides the most welcoming platform for these histrionics: crippling paranoia, desperate loneliness, masochistic death-wishes, dangerous obsessiveness, apocalyptic hysteria. Unlike her male counterpart - 'the eccentric' - the female neurotic lives a shamed existence, making these films those rare places where her destructive emotions get to play. Named after the U.S.-retitling of Carlos Aured's Blue Eyes of the Broken Doll, HOUSE OF PSYCHOTIC WOMEN is an examination of these characters through a daringly personal autobiographical lens. This sharply-designed book with a 32-page full-colour section is packed with rare stills, posters, pressbooks and artwork that combine with family photos and artifacts to form a titillating sensory overload, with a filmography that traverses the acclaimed and the obscure in equal measure. Films covered include The Entity, The Corruption of Chris Miller, Singapore Sling, 3 Women, Toys Are Not for Children, Repulsion, Let's Scare Jessica to Death, The Haunting of Julia, Secret Ceremony, Cutting Moments, Out of the Blue, Mademoiselle, The Piano Teacher, Possession, Antichrist and hundreds more! Have You Got a Magnificent Problem? Compendium of Female Neurosis. A cross-section of horror and violent exploitation films that feature disturbed or neurotic women as primary or pivotal characters. Click here to download or listen to The Projection Booth podcast with author Kier-La Janisse. Kier-La Janisse is a writer and film programmer who co-founded the Blue Sunshine Psychotronic Film Centre and The Miskatonic Institute of Horror Studies in Montreal, where she also edits the Fantasia Film Festival's online magazine, Spectacular Optical. She has been a programmer for the Alamo Drafthouse Cinema in Austin, Texas, founded the CineMuerte Horror Film Festival and the Big Smash! Music-on-Film Festival (both in Vancouver) and was the subject of the documentary Celluloid Horror. She has written for Filmmaker, Rue Morgue and Fangoria magazines, has contributed to The Scarecrow Movie Guide(Sasquatch Books, 2004) and Destroy All Movies!! The Complete Guide to Punk on Film (Fantagraphics, 2010), and is the author of House of Psychotic Women: An Autobiographical Topography of Female Neurosis in Horror and Exploitation Films, published by FAB Press in 2012.